This photograph of the famous Trevi Fountain was taken way back in 2006. I could not get a complete shot of the fountain since the place was very crowded. Rome is one of our holiday spots…full of history and beautiful architecture. This entry was posted on June 21, 2008 by IdliDosa. 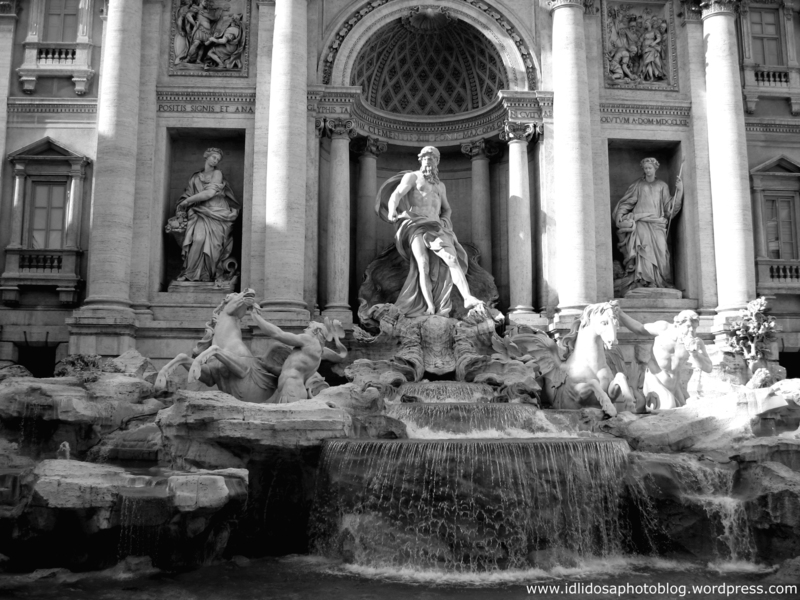 It was filed under Architecture, Black and White Photography, Places, Travel and was tagged with Architecture, black and white, Black and White Photography, fountains, history, holiday, holiday spots, italy, photo, photo blog, photo blogging, photography, pictures, rome, Travel, trevi fountain, vacation, wordpress, wordpress photo blog. hi can i link your website to mine.. I like your photoes alot.. They look very nice even to my inexperienced eyes..
I’ve never been to Rome. However, if I do I will make sure to see this fountain. Excellent shot, amazing details and composition. Like the B&W processing for this image. This is one of the places on my “to visit” list. I really like this in black and white. The crowds there can be a little overwhelming but sometimes you are lucky enough to get one great photo. This is a very good one also. The fountain is unbelievably beautiful. Hi, this photo is gorgeous! My friend Zoe and I were there last year. I would love to buy this for her as a Birthday present and get it framed. Would you consider sending/selling me the digital image/print so I can get it framed? Could you mail me your I’d to idlidosa@rocketmail.com and I’ll figure out how to go about sending the picture to you. Cheers!